Dustin Brown doesn't agree with the Los Angeles Kings' decision to strip him of their captaincy after eight seasons and two Stanley Cups. After eight seasons and two Stanley Cup titles as the Los Angeles Kings' captain, Dustin Brown thought he deserved better. 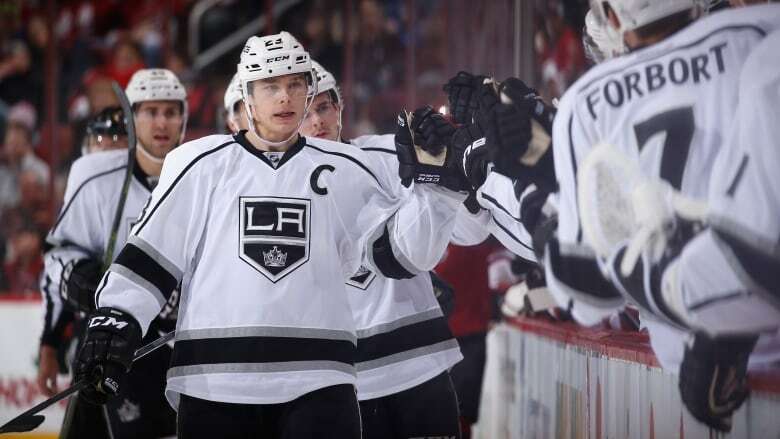 Brown doesn't agree with the Kings' decision to strip him of their captaincy this summer, and he aired his differences with team management Thursday in a phone interview. "I felt like I've done a very good job leading this team," he said. "The last couple of years have been really disappointing for all involved, and we all have a lot of work to do to get back where we want to be. "But I just remember when I was named captain, where we were at as a team. It was not a pretty picture. So what I've been able to accomplish with the help of a lot of my teammates has been pretty great, and I felt I'm still able to do that." Anze Kopitar was appointed the Kings' captain two weeks ago after a series of meetings among Brown, coach Darryl Sutter and general manager Dean Lombardi. Brown said the decision was made several weeks before that, but the team waited to announce it until well after news of the plan leaked to reporters. "Ultimately, I understand the decision and I respect the decision," Brown said. "Part of my problem was how it was handled. It just put me in an awkward spot." Brown also said he believes the Kings have tried to trade him. When asked to describe his current relationship with Kings management, he replied: "I'm not going to say it's rosy." His declining offensive production and his $47 million US contract through the 2021-22 season make him practically unmovable, but Brown isn't interested in leaving, anyway. Brown hasn't scored 30 points in any of the Kings' past four seasons. The U.S. Olympian is no longer widely considered one of the NHL's top power forwards, and Lombardi said he hopes Brown will rediscover his game with the burden of leadership lifted. Brown didn't want to be rid of that burden, however. "It was a tough pill to swallow," Brown said. "There are a lot of emotions that go through it. But at the end of the day, it was really out of my control because this is a management decision, not the players voting on it or anything like that. To be quite honest, it would've been a lot harder had it been my teammates doing this." Brown acknowledged he has had differences with Sutter, who became the Kings' coach in late 2011, more than three years after Brown became captain. Brown said their recent clear-the-air meetings "probably should have happened a year ago." Sutter and Brown led the Kings to two titles and 10 playoff series victories from 2012-14, but Los Angeles missed the playoffs entirely in 2015. The Kings led the Pacific Division for most of the past season, but were eliminated by San Jose in five first-round playoff games. Los Angeles' struggles in the past two seasons — and Brown's shortcomings on the ice — ultimately led to the change. "I enjoyed the responsibility, but whether I have a 'C' on my chest or not, I'm going to put pressure on myself to be better, because I'm not OK with just being OK," Brown said. "If you are, then you're out of this league pretty quickly. I think this is maybe them trying to get me to a place where I'm not worried about the young guys, or all the stuff you kind of have to worry about a little bit more when you're the captain, and now I can just focus on my game a little bit more." Brown still threw his support behind Kopitar, his teammate and close friend for the past decade. Kopitar has led the Kings in scoring for nine consecutive seasons, and he won the Selke Trophy last week as the NHL's top defensive forward. "I think Kopi is going to be a great captain," Brown said. "I've been with him since he came into this league, and he'll be fine in this situation. I have all the faith in the world in Kopi in being the guy now, but from my perspective, I wasn't happy with this decision."